Tia Noelle Pratt, Ph.D., is a professor of the sociology of religion at St. Joseph’s University and a member of St. Matthias Parish, Bala Cynwyd. Catholics make up roughly 25 percent of the population of the United States. Yet according to recent figures only about 7.5 percent of African Americans are Catholic. Why the disparity? 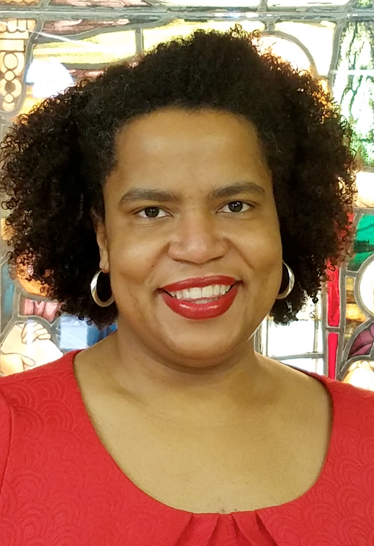 There may be many factors but Tia Noelle Pratt, Ph.D., who is an instructor in the sociology of religion at St. Joseph’s University, has a succinct answer – a legacy of systematic racism in the church. In a lecture at the American Catholic Historical Society held in Philadelphia on Feb. 11 (Abraham Lincoln’s birthday), Dr. Pratt mentioned some of the most egregious examples. For instance, in the 18th and 19th centuries the Jesuits owned plantation slaves then sold them in order to invest in more profitable ventures, including St. Joseph’s Church in Philadelphia. Among other practices, the church administered sacraments to the slaves except for marriage because once sacramentally married it might problematic to break up their union by selling husbands and wives separately. Later, free African Americans were relegated to a balcony or other less desirable spaces in a church for worship services. Consequently Black Catholics and even their children received holy Communion separately and after Caucasians. Also, African Americans were rarely admitted to studies for the priesthood or religious life, a practice that held until recent decades. Up until the 20th century, most African Americans lived in the former slave states of the South and if they were Catholic either in Maryland or Louisiana. That is because Maryland was the only one of the 13 original colonies to be settled by Catholics and Louisiana was founded by Catholics from France. Logically the slaves followed the religion of their masters. Pratt’s ancestors were from Louisiana, and they came north toward the end of the first wave of the Great Migration, probably in the 1940s, she estimates. In her own childhood she began school up to sixth grade at West Philadelphia’s St. Our Lady of Victory Parish, where she was taught by Sisters of St. Joseph. This was followed by two years at St. Callistus with a lay faculty and for high school to West Catholic, from which she graduated in 1995, and then went on to Chestnut Hill College. During her time Our Lady of Victory was mostly African American and there were a fair number of African Americans at St. Callistus and West. There was even was some diversity at Chestnut Hill. Nevertheless during her college years she perceived that in much of the world, being black and Catholic were not seen as going together. Her first love really was sociology, and her own personal experience as a Black Catholic led her to look at theology from a sociological perspective. Her thesis was on “Identity Formation of African American Catholics,” and Pratt said she “wanted to learn why it was the way it was. I wanted to contribute and help break that myth,” she said. While she is doing that through the study of the sociology of religions, scholars in other disciplines are doing the same, she noted. Maybe it has taken hundreds of years, but progress is being made. “As a first step, the church must acknowledge the past and own it,” Pratt said. Now that Pratt is back in the Philadelphia area, she misses New York and the Bronx on one level but overall it is good to be home. She is an active member of St. Matthias Parish in Bala Cynwyd, where she serves as both a greeter and lector, which can be tricky on occasion if she is both at the same Mass. “It is a good parish and I’m happy to be a member,” she said. I am greatly disappointed by the comments here. The Catholic Church does so much good, BUT it is also a human institution and therefore cannot be expected to be without sin. Denying the reality of institutional racism in the Church serves only to assuage white guilt. We have to own up to our history in order to see the very real lingering racial prejudice that still effects black Catholics today; racism is NOT dead and gone, no matter how much we wish it was for our own peace of mind! At the beginning of her talk, Dr. Pratt mentioned the importance of leaning in to what makes us feel uncomfortable. It’s human nature to try to avoid topics that are unpleasant, so of course the initial response for white Catholics would be to reject the truth that Dr. Pratt is bringing to the forefront of our minds. Instead of this, though, I’d like to challenge all who feel angry or uncomfortable over this topic to take a step back and change their mindset to one that is open to learning. You may or may not come out the other side with a different opinion, but at the very least you’ll have bettered yourself in the process! It’s confusing when the article says Pratt misses the Bronx and NY without first saying that she got her Ph.D. at Fordham University. Professor at a Catholic University and living in Bala Cynwyd. Society and the Church have treated her so harshly. Spare me. While it’s a good thing to study how African Americans were mistreated in the past and learn from our mistakes, to claim things still need fixing is ridiculous. The Catholic Church of today is one the least racial organizations in existence. To say things need fixing or things can be fixed implies there are still significant problems. It smacks of claiming to still be victims. Such an attitude tends to divide rather than unite. Praise the Church for all it does. Our diocese in Lansing MI has struggled with racism. Many here are defensive when talking about racism and white priveledge. They don’t want to be perceived as racist. I think what racism looks like has changed from the past. There are still those who are blatant and not ashamed for their hatred of others. Moreover though, I see fellow catholics in my area ignoring or minimizing the experiences of people of color. This allows for a blissful ignorance that allows for racist attitudes and white supremacy ideology to go unaddressed. To me, when a person gets so defensive, they are complicit in perpetuating the ideologies of systemic racism. I may not have caused the racism around me but it is my responsibility to be a part of the solution. I don’t know what end this article is trying to achieve. I’m not sure what needs to be “owned”. Is someone disowning it? I don’t know what “systematic racism” still exists, but this article’s title packs quite an ugly accusation. I’m so exhausted by people being pitted against each other in the current political climate. I’m sorry to see it here as well. The whole judicial system is systematically racists. While I do agree a bit with Mark in that we truly do not know what it is like to walk in another person’s shoes, it is tiresome that some such as Prof. Pratt continue to hang onto the sins of past generations long gone. Citing things that happened centuries ago is simply recounting history. As a caucasion male Catholic I have been berated, judged, condemned, and classified in a most discriminatory way. So let’s not always apply racism to a particular race gender, or class of people. As a society we can all benefit from understanding each other but that goes for everyone. Again, those who continue to dig and dwell in the past will never move forward. It is as if they prefer to cling to a divisive message rather than living in today. We would all benefit from moving away from this harboring of constant claims of racism that is connected to centuries long past. Many, many ethnic groups have be discriminated against over the centuries for various reasons by various people. Let’s stop with the divisive nonsense and simply focus on the fact that we are all children of God. I shudder to think the messages that are possibly being brought up in that classroom at St. Joseph’s. ” The Church can be fixed.” Please, fixing starts in the individual heart and we are all better served to stop living in the past and move toward the future by living now in today not the 19th century. I read Ms. Pruitt’s article with an open mind and understanding. There have been many injustices suffered by many ethnic groups in eras of the past. I would like a better explanation of what she means by the statement “As a first step, the church must acknowledge the past and own it”. And what would the next step be? And no mention of the real problems in the African-American communities which include broken families, absent fathers, and the lack of education despite many opportunities that are available including school choice. Keep blaming white people and African-Americans will never improve the lot of their communities. This is another woman and a black that wallows in the past and thrives on being part of the victim mentality. She’s employed by a Catholic University yet she still looks at herself as a slave. I suggest that she listen to Starr Parker, David Clark, Herman Cain, Diamond&Silk, etc and get off the pity pot and quit the blame game. The best advice to living that I ever got was “it’s ok to look back, just don’t stare”. Please listen to other’s experiences that are different than your own. Multiple things can be true at the same time- that some people have felt unwelcomed and unsupported in our church and that others have felt welcomed and supported. Defensiveness is an obstacle to us growing and becoming more and more of what God desires from us. Blame, blame, blame. The Catholic Church is the most welcoming, friendly, and supportive Church. What is the point of the recital of selective history? The effect is to bring the Church down, to ignore the essential good works of the past and ,one conjectures, to play out some internal or professional cause. The Catholic Church, notably in the great Archdiocese of Philadelphia, including the Jesuits whose self-giving to minorities is famed, should be praised for all that she did and does for African-American people. The hands were and are out, and she gives and gives. For just one example among the thousands or millions of assistances that have been given: a non-Catholic woman, speaking recently of her daughter’s education, mentioned only as an after-thought that she received $10,000 from a parish to put her daughter through elementary school.